I hope you had a good week. I have been busy starting back to school. I am in 8th grade this year. My last year of Middle School! It was nice to get back and see my friends, many of them I did not see all summer. I had a fun weekend at the NESBC Season Finale at Canaan with the Penguin Racing School. I am very excited to tell you at I won the Bazzaz Intermediate B Championship! Saturday morning started the weekend off with practice and classroom sessions until early afternoon, with the race schedule starting around 2pm. In the race to determine the championship winner for the Bazzaz Intermediate B Class, it was a great battle between Eli Block and I. We were tied for points going into this race and I know he wanted it as badly as I did! On lap 3 , I took the lead with Eli hot on my tail. We diced it up several times before I was finally able to hold him off and secure the win and the Championship! This was not an easy win, but we were both told it was the race to watch! 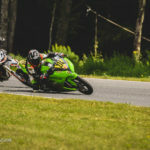 In the Formula Ultralight Class, racing against primarily larger bikes and after a start that was nothing to write home about, I was able to secure a 3rd place finish. My bike was running flawless and I felt I was pushing it to the max, it took me 6 laps to work my way up through the field to earn the last spot on the podium. I was also a member of "Team MT Wallet" along with Eric Block (Captain), Eli Block, Teagg Hobbs and Bill Morey for the combined points championship for the AutoMall of Brattleboro NESBC Team Championship Challenge. 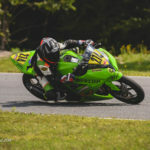 The series created this team challenge as a way to bring riders of different experience levels and classes together in order to help the riders grow and become better racers. It was a lot of fun and even more exciting to win the Championship and $1,000 prize that was split up among our team members! On Sunday, we ran practice in the morning with the Northeast Dealership Challenge races at noon! In this challenge, motorcycle dealerships in the Northeast form teams to see who is the "Fastest Dealer in the Northeast." I was on Team Woodcraft. Eli Block was on Team Manchester Honda. There are four races in this challenge to determine the winner. I raced in the Amateur/Novice race and once again it was a true battle between Eli Block and I! We fought and battled back and forth for most of the race between 2nd and 3rd places trading positions quite a few times. The leader was too far out front for us to have any focus on him. On the last lap, I was in front of Eli and was feeling good about being able to secure second place, but on the last half of the final lap, we came up on a lapper. I made the decision to go under the him, while Eli went on the outside. My decision to go under cost me the position when the lapped rider decided to dive down and I was forced to check up. Eli was able breeze right by to secure the 2nd Place position and I crossed the finish line in 3rd place. Although I was not completely happy about the end result, it was a really fun battle to say the least! In the end, Team Manchester Honda was the named the "Fastest Dealer in the Northeast" and Team Woodcraft finished in 2nd Place by 5 points. I am already looking forward to next year at Canaan! I had a blast all season getting to dice it up with friends! 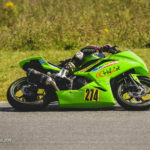 But for right now, I am focused on wrapping up my season this weekend at Boxshop Mini Supermoto and GP track in Maine. This is where I was given my first opportunity to try out the asphalt and I love going back there as much as possible. Saturday, I am a guest instructor at their NHF/NEMM Supermoto School that they will be putting on for a small group of about 6-7 kids. I really enjoy working with other kids my age and younger. Sunday, I will be racing there in both the Supermoto and GP classes. Below are some pictures that I think you will like. All taken by Bob Stengel of 22photos.net.